I am attenpting to drive a 20-A motor in sensorless velocity control mode. In order to get the motors to output the torque I need for my system, I had to set the current_setpoint parameter to 100 which keeps the motor from stalling. However, in doing so, after exiting the ramp-up state the motor will spin up, exceeding the target velocity before slowing down again. Is there another tuning parameter I may be missing? I need the current setpoint to be high, else the motor will stall at too low a load, but the windup is its own control issue. What type of load is it? Is it mostly mass or is there a lot of friction/drag also? It seems you want to spool it up very quickly is that the case? The motors are for a drivetrain. I want the motors to ramp up from rest to a set velocity while being able to carry the load of the vehicle. I have three ODrive 3.5s operating six NeuMotor 1907 3Ys to move a 50 KG vehicle. When I do not set the value "“controller.current_setpoint” the drives stall out before moving the system. When I set the value of “controller.current_setpoint” to 100* the motor has enough torque to move the system, but when going from the ramp-up state to the open-loop-velocity state the motor will jump from its spin_up_target_vel to a speed past the vel_ramp_target before resolving to the vel_ramp_target. This puts a lot of strain on the gearboxes and is non-ideal for short-distance control of the vehicle, so I’m trying to eliminate that overshoot. I have not set ..config.lockin.current, so it would be set to its default value. I am out of the shop for the week and wont be able to test until Saturday, but I’ll certainly give this a try. Can you explain what the lockin parameters do? That is in the new (as of now unreleased) firmware version. 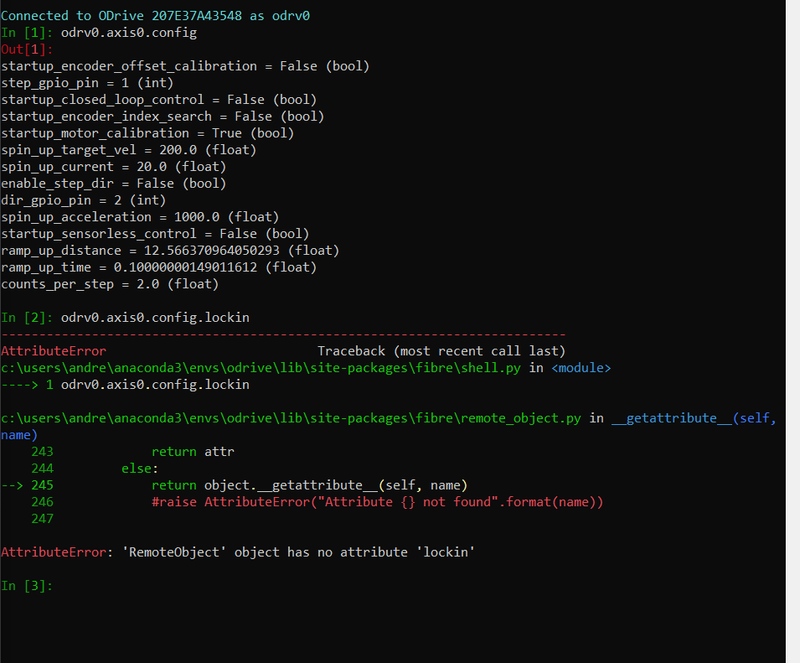 You probably have it as odrv0.axis0.config.spin_up_current. I had the spin_up_current and current_setpoint both set to 20.
when I set spin_up_current to 20 and current_setpoint to 0, the motor would spin up just fine and not overshoot, but would not have enough torque to move under a load. It would spin up, but then immediately stall. Adjusting the spin_up_current only changes the motor acceleration in the spin_up state. Once it exits that state, the motor overshoots. I believe the issue is caused by the current_setpoint parameter engaging immediately following the spinup. I have tried to adjust the motor.current_control PI parameters and saw no difference in operation. I wrote a current rampup function in my external controller to slowly ramp up the current_setpoint after the drive is enabled to mitigate the overshoot while allowing full current to be quickly delivered to the drive. That seems to work alright but there is still a bit of overshoot, and setting the current setpoint lower would mean the drive initially has less torque. That may be the best I can get using sensorless control though. I would suggest not changing the current_control.p/i_gain, instead you should set the motor.config.current_control_bandwidth, it will update the current control gains for you. You can try to turn it up a little bit later if you need faster response. I would suggest to leave current_setpoint at 0, since otherwise you may get issues at steady-state. If all that still stalls it out, you can try this feature branch, where I have added an inertia term to the ramped velocity mode (see here). You set it at controller.config.inertia with units of A/(counts/s^2). You can set that value to the amps you seem to need to accelerate, divided by your vel_ramp_rate.